Families are welcome to come and watch. Encourage them to arrive after 1pm. The best viewing is probably between 2-3:30pm. Please make a lunch plan with your team members. There will be no food for sale at the event. Students can bring lunch with them or there is a mall across the road with a food court. You could have one adult go and pick up lunch for the team and bring the food back to the venue. 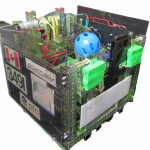 At League events, teams will go through robot inspection and play 5 matches. Teams that don’t think their robot is ready, should try to come around 10am. Teams will help each other to get their robots finished and through inspection. Is your team interested in a practice Judging Session to help them get ready for the Championships on Feb. 23? Please sign up for a time slot. We’re still looking for at least one more adult to be part of the practice judging panel. Let me know if you have a 2nd coach or parent who would like to volunteer to help. – Robot plus spare parts, motors, cables, ….